In this engaging introduction to the red fox (Vulpes vulpes), J. David Henry recounts his years of field research on this flame-colored predator. With its catlike whiskers, teeth, and paws, as well as vertical-slit pupils, the North American red fox not only resembles but often behaves like a feline, especially when hunting. Probing the reasons for these similarities, Henry reveals the behavior and ecology of a species that thrives from the edge of suburbia to the cold northern tundra. 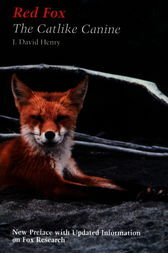 J. DAVID HENRY is a biologist who spent six years studying red foxes in Canada.